The Canadian Business Aviation Association handed out several key awards at its 2017 CBAA Convention & Exhibition Aug. 9-11 in Abbotsford, B.C. Doug Thierman, director, aviation and chief pilot at Shaw Communications. Thierman was given an Honorary Lifetime Membership to recognize his many contributions to business aviation and the CBAA. The presentation was made by CBAA board member, Scott Harrold of Signature Flight Support. 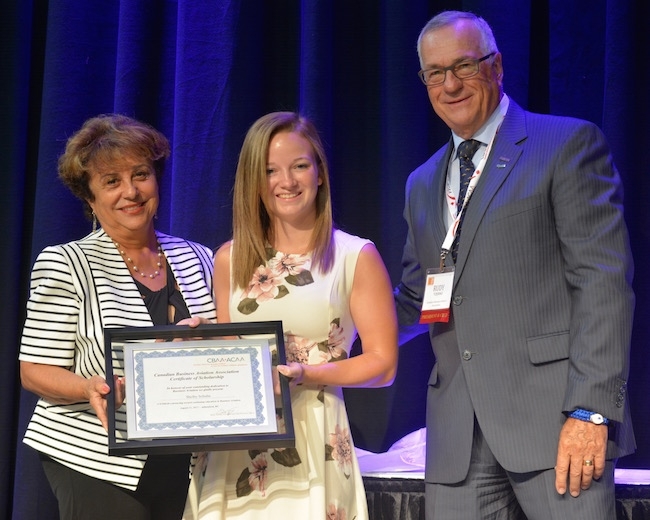 Three scholarships were awarded, part of CBAA’s committed to attract and retain “the best and the brightest” in business aviation. Owen Titerle, B.C. winner of the 2017 Webster Memorial Award, was presented with a bursary to continue his education as were the two recipients of CBAA’s new Schedulers & Dispatchers Scholarship: Shelby Schulte, Manager, Flight Coordination at AirSprint Inc. and Jill Dermott, Customer Service Representative at Skyservice FBO and First Officer, Lake Central Airways. With over 400 members located in every province and territory, the CBAA is the voice of Canada’s $12.1 billion business aviation community.